Come Play with UMSC! Our Lil’ Striker programs are organized by ages to provide the best possible learning and development environment for all players. Your child will have an opportunity to work in small teams to ensure lots of touches on the ball and the most one on one time with a coach. All sessions are guided by certified/qualified staff coaches to ensure your child is getting the best training possible. Sign your son or daughter up today for their first soccer experience with the Unionville-Milliken Soccer Club! 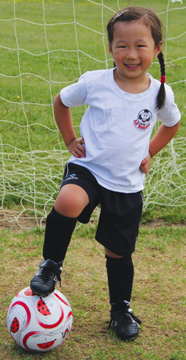 If you are new to UMSC, create a profile in your name (parent or guardian) and then add your child as a player. Once you do that you will be able to see the registration for Lil' Striker Parent & Tot.